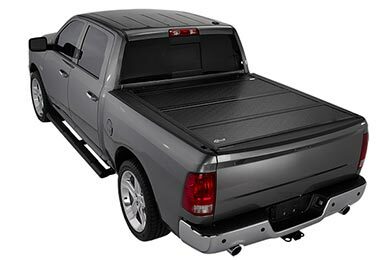 Read 1593 customer reviews about BAK Tonneau Covers that have an average rating of 4.5 to find out what product is best for your vehicle. 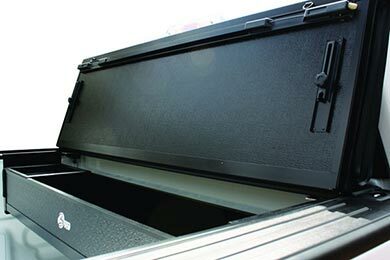 The cover was easy to install, except I had to cut away some of the bed liner in the corners where it interfered. It looks great and is very easy to operate. Installation was easy and so far it's been a very good cover. The packaging of the unit was outstanding. The install went fairly well but the inclosed install directions are terrible. There was no mention of the adjustment procedures. These were made by trial and error. The cover is not totally water tight but I didn't expect it to be nor is it claimed to be. 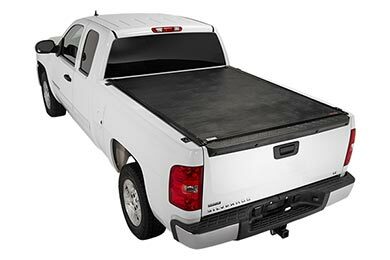 This is a solid, secure tonneau and I am pleased with the purchase. Also, Mike at AutoAnything was great during the ordering process. 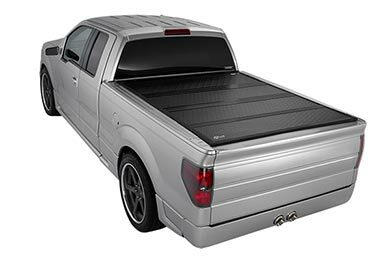 I installed my Rollbak GS tonneau cover on my 2012 F150 in about 1.5 hrs by myself. I followed the instructions that came with the cover as well as watched a youtube video on how to do it. Overall I am pretty pleased with the cover. I have had a few different types of covers. I seem to really like this one. 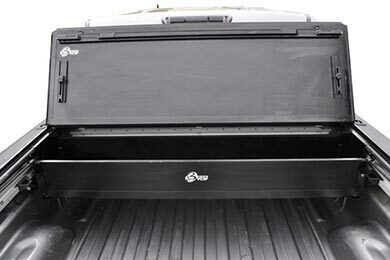 Had no trouble installing the cover, just some slight adjustment to fit correctly on the truck bed. The only complaint would the aluminum shaving that were left within the cover when rolled up for shipment. Nice design. Could be a wider and deeper. Also a little pricey. Easy install. Designed my own retainer claps to keep from sliding. Fits great and easy to install. No leaks either. 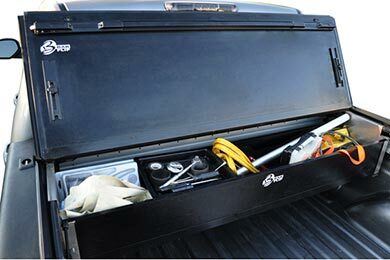 I carry several items in my truck all the time with no concerns of getting stolen or damaged due to weather. Cover was well packaged and delivered ahead of schedule. The directions provided were not for the cover received, however, the on line video was clear and it was simple to install. It took a few days for the rubber edge molding to relax after being folded up for shipping and delivery. The cover has been on the truck for less than a month. I did not install the drain tubes and there was only a trace of moisture inside the bed after going through the car wash. The cover looks and fits great. 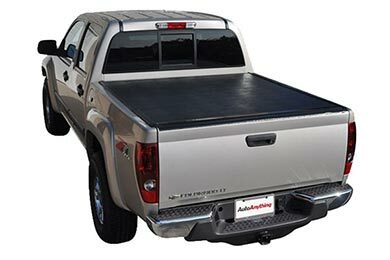 I installed the BAKFlip Fibermax cover on my 2009 Toyota Tacoma. The cover came in excellent condition and with all the parts. I installed the cover after looking at the video on UTube and, which was very helpful. I only had a slight problem of fit due the tie-down track near the truck cab conflicting with the metal tabs on the underside of the cover. I cut about 1/4" off the tabs to get a perfect fit. The cover looks great with its flush mounting shiny textured surface and easily opens and closes as advertised. It looks fairly water tight,but I haven't checked it out under wet conditions yet. Install was simple and quick. You do lose the side utility rails but I don't use them anyways. 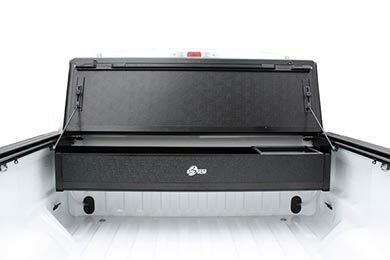 Ability to fold all the way up to the back of the rear window was a definate deal sealer. Only one issue was the drains for each rail, I used some step down hoses I had and used them instead if the monsterous sized ones you get. Again, well worth my money. 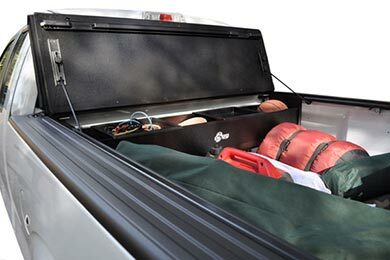 Oh and I wish they made the toolbox system for my truck but that's only for the 6ft bed I think. Easy to install, but it leaked. I had to seal the edges. other than that, a really good product. THE INSTRUCTIONS COULD HAVE BEEN BETTER. I HAVE A 2005 NISSAN FRONTIER. 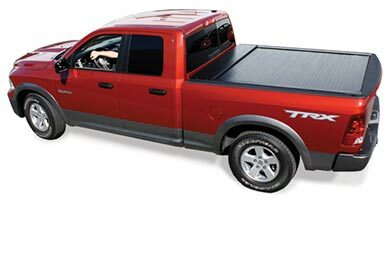 THE 6 PICTURE INSTRUCTIONS SHOWED A DODGE RAM. 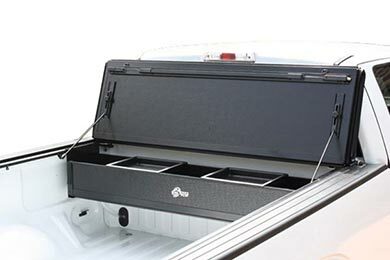 IT DID NOT SHOW HOW TOU USE THE SIDE MOUNTING BRACKETS IF YOU HAVE THE UTILI-TRACK SYSTEM IN THE BED. I FIGURED IT OUT MYSELF. THERE SHOULD HAVE BEEN A PARTS LISTING SO YOU WOULD KNOW WHAT IS WHAT. I HAD TO FIGURE OUT ON MY OWN THAT THE TWO METAL SLEEVES THAT WERE THERE HAD TO BE INSERTED INTO THE PRE-DRILLED HOLES WHERE IT MOUNTED TO THE SIDE RAILS. IT LOOKS GREAT AND WAS FAIRLY EASY TO INSTALL ONCE YOU FIGURE IT OUT ON YOUR OWN. Reference # 760-256-385 © 2000-2019 AutoAnything, Inc.